Out of ‘Sight’ Football – If you’re a football fanatic, this game will make you a NUT! With a dry-erase pen and your EYES COVERED by a Playbook, how well can you evade tacklers, pass to receivers, or execute kicking plays? That’s the CHALLENGE of Out of Sight Football ! But beware your opponent’s hidden Linebackers! They can Stuff Runs, Intercept Passes, Cause Fumbles, or Blitz when you least expect it ! 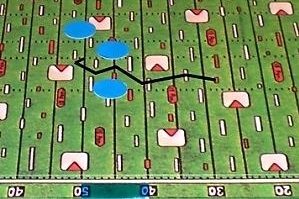 Imagine owning a unique dexterity/strategy game of American Football! And you can add gameboard inserts for Basketball, Soccer, Ice Hockey – see “other sports” above! Field is laminated for easy erasure. 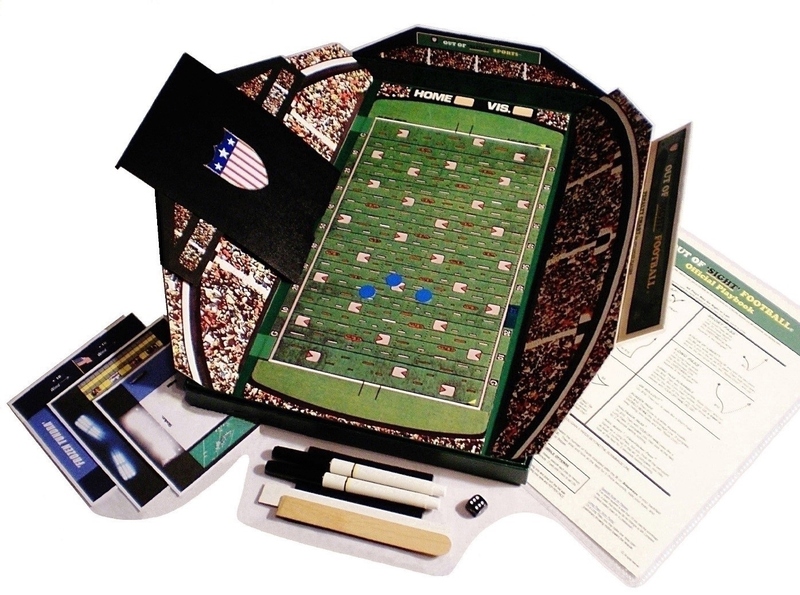 Includes: Kickoffs, Punts, Field Goals, Sacks, Safeties, Blocked Kicks, Fake Kicks, Laterals, Run/Pass Blocking, Injuries, Clock Management, Slo-Mo Replays, a Playbook with fifteen offensive play choices plus play variations (right, left, middle) for OVER 40 total play choices. Best for 2 to 6 Players, Ages 12 and up. Lightweight, 1.5 lbs, and folds into a box 16″ x 10.5″ x 1″. Converts to Basketball, Soccer, Ice Hockey… See “other sports” above. Only $49.95 for Football Game! Available only in Dallas, TX. Add $20 for each additional sport. Allow seven days for delivery. PLUS: Upper Decks, Press Boxes, etc. to customize the stadium are printable from “extras” above.